Contents introduction Limited DVD-BOX products contained in 3BOX " Doraemon " the work of 25 to 2004 , re- released as [ Standard Edition ] In answer to the hot demand ! 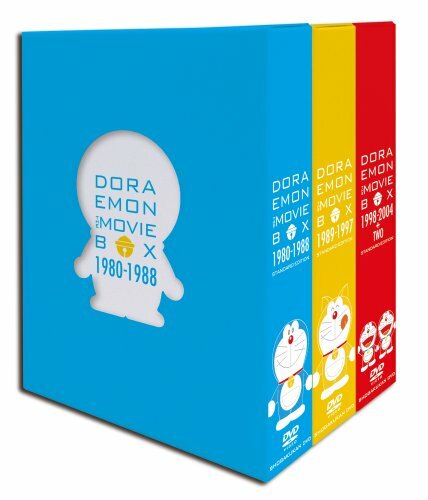 Released the same day · " DORAEMON THE MOVIE BOX1980-1988 " [ Standard Edition ] · " DORAEMON THE MOVIE BOX1989-1997 " [ Standard Edition ] · " DORAEMON THE MOVIE BOX1998-2004 + TWO " [ Standard Edition ] It is the product which summarizes the three works . ※ to this product , shipped was released in 2010 in the " DORAEMON THE MOVIE BOX ", " miniature theater brochure " is not attached . [ Publisher ] Shogakukan (C) Fujiko Pro Shogakukan TV Asahi Contents ( " Kinemajunposha " database) BOX that contains the movie version was released in 80-04 of "Doraemon" . " Dinosaur movie Nobita " "Space Was Won of Nobita ," " large Makyo - Nobita ", " submarine Oniiwa Castle of Nobita ," " Makai Daibouken - Nobita " other " small universe of Nobita war " , 25 pieces I record Heiei work with .